April 15, 2018 at 12:09a.m. Photo by Scott Williams | Poland baserunner Brooke Bobbey scores as South Range catcher Jillian Strecansky retrieves the ball during Saturday’s game in Poland. The Bulldogs rallied for a 12-8 victory. Falling behind by three runs twice against a team as talented as South Range would have a lot of high school softball coaches concerned. Poland’s Jim Serich took it in stride. That’s how confident he is in his batting lineup. “Everybody’s hitting, top to bottom,” Serich said after the Bulldogs rallied for Saturday’s 12-8 victory at the North Elementary Complex. “[We’re] staying positive, we’ve got everybody picking each other up. Everyone in the starting lineup either produced a hit or scored a run for the Bulldogs (9-1). Brooke Bobbey doubled and scored twice. Sarah Boccieri singled twice, scored once and drove in a run. Winning pitcher Ashley Wire had two hits and scored twice. Ally Nittoli singled and scored. Lauren Sienkiewicz doubled and scored twice, Camryn Lattanzio drove in two runs with two hits. Payton Slaina singled, scored and drove in a run. Tori Moderelli doubled and scored. Rachel Wolfe drove in a run with a sacrifice and scored a run. “At different times, everyone is contributing,” Serich said. The Raiders (9-3) lost despite producing 18 hits. “It started out well,” South Range coach Jeff DeRose said. “We proved we can hit the ball. We out-hit them, but they made some key hits when it counted. Bree Kohler, Hanna Dennison, Madison Weaver and Marlaina Slabach each had three hits while Hope Thomas and Abbey Bokros had two apiece. The Raiders scored three times in the top of the first inning, but the Bulldogs came back with two runs in their first at-bat. Wolfe’s sacrifice scored Slaina with the tying run in the second. The Raiders (9-3), who spent last week at Myrtle Beach, S.C., responded with a three-run third inning, with Drew Feren, Bokros and Maddie Helon driving in runs. Poland sliced the lead to one in their next at-bat with Sienkiewicz and Lattanzio driving in runs. The Bulldogs exploded with a seven-run fifth inning, sending 12 batters to the plate as the Raiders committed three errors. 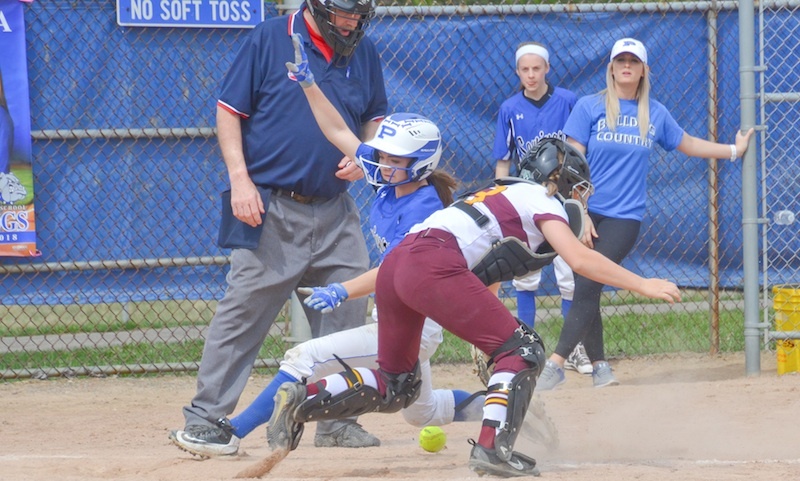 The Raiders scored again in the sixth inning, prompting Serich to relieve Wire with Monica Kurjan, the senior who pitched in Poland’s win over Steubenville several hours earlier. “I’ve been warm all day,” said Kurjan, shrugging off a suggestion that her task was difficult. She said she “chilled” while eating lunch, then warmed back up before the game. Her win-save combo was the first in her varsity career. “It was a fun day,” Kurjan said. “The defense played great and our bats were moving, too. August 4, 2016 12:05 a.m.
July 19, 2016 12:05 a.m.
July 29, 2016 12:09 a.m.